Unless you’ve been living under a rock for the past couple of years or have cut the cable and don’t watch daytime television anymore, you’ve probably more than aware of the NutriBullet. This heavily promoted blender is touted as being the greatest thing since sliced bread as far as nutritious living is concerned. Its ability to extract the nutrition from apple cores, seeds, and other fruit and veg parts we’d normally throw out is said to be unlike anything else. There’s certainly a tremendous amount of media-driven hype surrounding the NutriBullet. The question is, how much of that hype can be justified? We’ve taken a closer look at the NutriBullet’s performance and can say that it’s a solid blender worth investing in, even if some of its marketing team’s claims may be a bit over exaggerated. Clean, elegant, and massive, the NutriBullet is the definition of a contemporary kitchen appliance. A single speed setting prevents the blender from being as versatile as we’d like. Put your ingredients in, close the lid, secure it to the base, and push down – it’s that simple! It is reported that the blades may snap under extreme stress, but the NutriBullet held up well under normal circumstances. Overall a fairly priced single-serve smoothie maker that does its job well! The NutriBullet is targeted at two kinds of people – those who’ve been neglecting their health their whole lives and hope to improve it by eating healthier, and those who are already doing so. From the single-speed setting to universal lids that easily snap on and off, everything about the NutriBullet Pro is designed to get you to prepare smoothies, milkshakes, and other health drinks with as little fuss as possible. It is the perfect choice for those who want to make a single-serve smoothie with no fuss. This is a newer version of the first NutriBullet. The original package contained 15 pieces, while this one has 13 as a cup and lid have been removed. Still, you do get a good selection of accessories. You get extra-large 32-ounce cups with interchangeable lids, two lip rings with handles and two without, and an emulsifying blade. Along with the blender and its accessories you get a user’s guide, a handy booklet with basic recipes to get you started, and a hardcover recipe book containing many more smoothies and shakes to try out. You'll get the high-torque power base, an emulsifying extractor blade, two cups and accessories and a recipe book to get you started. Appearance wise, the NutriBullet Pro looks modern and minimalistic. As there are no buttons to clutter its front up, it’s as much a work of industrial art as a blender can be. The biggest change from its original version is an upgraded motor. Its 600-watt motor has received a 900-watt replacement that’s even better at tackling the hardest parts of any fruit or vegetable you want to extract the most out of. Leafy greens, whole pears, almonds etc. all turn into a nutritious liquid in the blink of an eye thanks to the combination of a powerful motor and capable blades. Speaking of which, the blades have an innovative design in that they’re part of the lids themselves. Both lids easily snap onto the 32-ounce jars. Once filled up, the jars need to be turned upside down so that whatever you’ve put inside first will actually end up being chopped up last. It takes a time or two to get used to this, but soon enough you’ll be placing the biggest chunks last so they can be processed better. The NutriBullet only has an on/off mode, but it can be set to work continuously unlike some other blenders with a similar design. You get two pairs of lip rings which let you have different approaches to serving the smoothies you make. Two of them have handles that turn the jars into pitchers you can pour the smoothies out of and serve to more than one person. Combine the lip rings that don’t have handles with the tight lids to create a portable source of nutrition you can take sips from wherever you go without fear of spilling. The new 900-watt motor is sure to give you all the power you may want from a top blender. We found the unclouded recipe book to be a good starting point for making some healthy concoctions. While the intro section warning people about the horrors of heart disease etc. seemed a bit long-winded, the actual drinks, or NutriBlasts as the book calls them, come out creamy and tasting like nature intended them to. When you’re done mixing up smoothies for the day, cleanup is a breeze. You can wash everything except the base and blades in a dishwasher, and can even substitute that with some soapy water and a few of the NutriBullet Pro’s strong pulses. Although it can get stuck to the sides of the jars due to the nature of its mixing process, food generally doesn’t stay stuck, making a good rinse the only thing you need to start mixing again almost as soon as you’re done with the last batch. 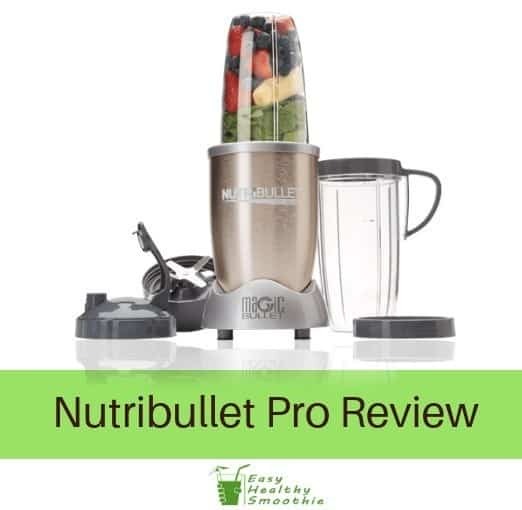 If you disregard the hype no blender could really live up to, the NutriBullet Pro is a capable, fairly priced single-serve smoothie maker that does what it’s supposed to well. It may not be the magic cure to all of your health woes, but if you use it every day and combine your newfound appetite for healthy food with some exercise, the NutriBullet might yet prove to be instrumental in turning your life around for the better.